Humble cereal; brownish maroon coloured; can easily be mistaken for mustard seeds by newbies in the culinary kingdom; rich in calcium and fibre; low in fat and hence best for calorie curbing; most favoured flour for baby’s bone development; diehard fan of diabetics; that’s Ragi (Finger Millet) for us. Ragi is most commonly used in flour form. So get ready to prepare this flour and what to do with it? Well….Ragi Malt, Ragi Lassi, Ragi juice, Ragi laddus, Ragi soup. One flour, multiple uses. Can’t imagine cooking getting simpler than this! 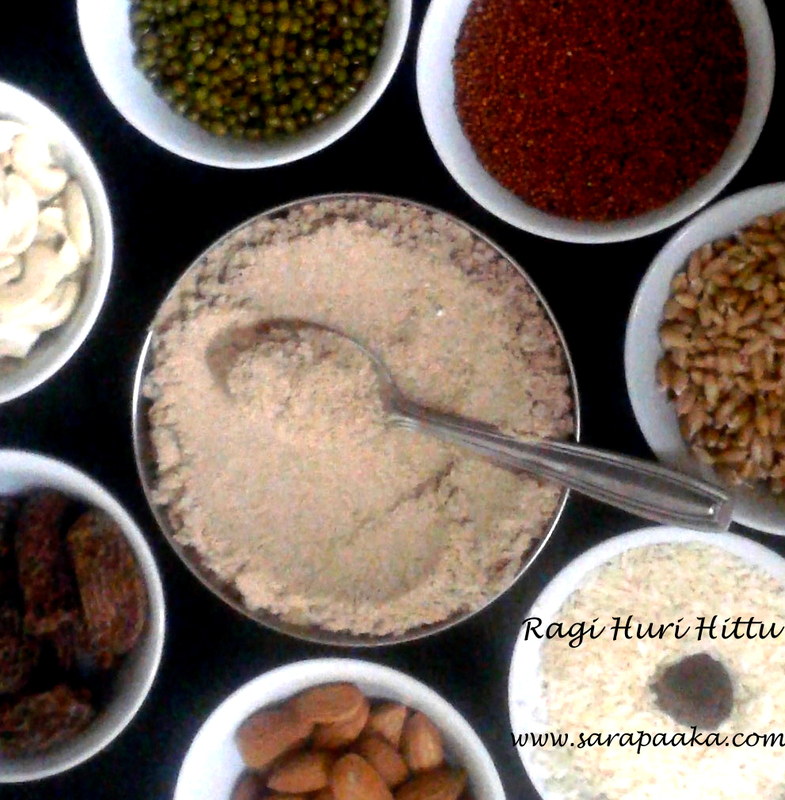 Ultra simple dishes from a staple cereal….all of these helping us grow richer in health and nutrition.While Ragi is the core ingredient in this recipe, many others are added to supplement, enhance and balance the nutrition value. Cardamom 4 to 6 nos. Dry fry all the above ingredients individually, in a skillet on low flame. Transfer each of them to a plate. Let it cool thoroughly. Else lumps will form while grinding. Grind them in a mixie (or in a flour mill) to a fine powder.While grinding, first grind hard ingredients like dried dates, almonds, cashewnuts, pista, peanuts and nutmeg followed by other ingredients. Do the grinding at intervals with short breaks in between so that heat generated by the appliance doesn’t get transferred to the contents. Even so, when the powder is completely done, it would have warmed up. Hence, immediately spread the powder in a thin layer form on a clean thick paper or on an absolutely clean and dry cotton cloth laid over a dry table kept in a cool, dry place. Let it stand till it completely cools down. Transfer it to an air tight container. Put 1 tbsp. of jaggery powder or liquid jaggery or sugar and 1 tbsp. of Ragi Hurihittu in a glass or tumbler. Put 1 or 2 tbspns. of water and mix them. By doing this way, jaggery and Hurihittu get blended well without any lumps. Now add hot boiled milk to fill the glass. Stir well. Ragi Malt is now ready. Drink it hot and stay energized rest of the day! Sprout Ragi, Wheat and Mung Bean a day before you plan to prepare this powder. Make sure they are dried completely in shade before dry frying them. Sprouted and dried in shade Jowar and Channa dal (brown) may also be included. The ingredients’ list mentioned in the recipe is only near close to ultimate! While we recommend using all of them and more! don’t get exhausted by the list. Try to use as many as you can. It will still be tasty. Few words we share since we care…..
Dry frying requires regular stirring and careful monitoring. The process calls for a lot of patience, proper attention and complete concentration. Nonetheless it is extremely enjoyable, turning you into a meditative mood and totally worth the effort. Do it just for the joy of it and enjoy the experience! Well, how to make Ragi Lassi, Ragi Laddus……etc. All of these for sure in one of our future posts.